The days of loudspeakers looking like, well, speakers is so 20th century. No more rectangular wooden boxes taking up too much space on bookshelves or tables. And increasingly, no more wires either. The amazing Amazon Echo is but one of the latest generation of wireless “smart” speakers going far beyond delivering just sound. It serves as a hub for a home’s Internet of Things (IoT) and with thousands of “skills” it could be an automated virtual assistant. Alas, the Echo still falls short of delivering the kind of audio quality audiophiles expect. Available initially in stylish black matte and now in white, the futuristically designed Echo stands 9.3 inches (23.62 cm) with a diameter of 3.3 inches (8.38 cm) and weighs a smidge over 2 pounds (1,064 grams). Featuring Wi-Fi and Bluetooth connectivity, Echo comes with a 2.5 inch (6.35 cm) woofer and a 2 inch (5 cm) tweeter. Compatible with the Fire OS, Android and iOS devices, it’s also accessible from a web browser. Echo uses the Bluetooth profiles, namely the Advanced Audio Distribution Profile (A2DP) for audio streaming from a mobile device as well as the Audio/Video Remote Control Profile (AVRCP) enabling voice control from connected mobile devices. The “Far-Field Voice Recognition” capability recognizes voice commands and questions from any direction, even if music is playing through the speaker. 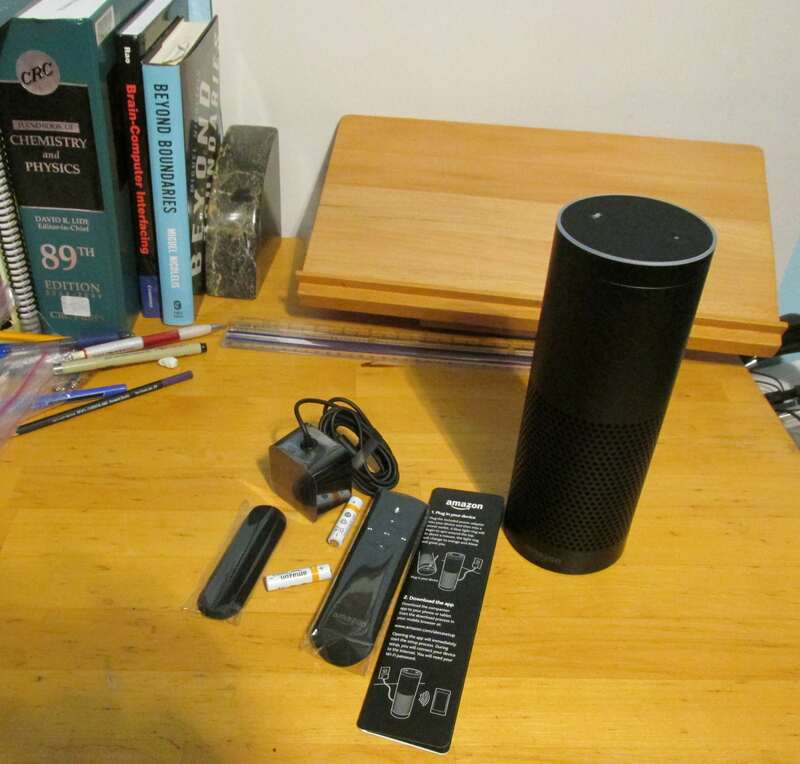 To use Echo, anyone in a room where the unit is located merely says the magic wake word “Alexa.” In response, the halo or light ring at the top of the Echo cylinder illuminates as the unit streams audio to the cloud where the Alexa Voice Service resides. Alexa recognizes and responds to requests and commands at once. Need to know the time of day? Or the air-speed velocity of an unladen swallow, either African or European (with a nod and a wink to Monty Python & the Holy Grail)? Alexa can give you the answers (maybe). You could also tell Alexa, for example, to add items to the home’s grocery list or “to-do” errands for spring cleaning. This list is current as of May 2016; more hubs are added as time goes by. These accessories allow remote control of appliances such as ceiling fans, coffee makers, lamps, TVs — anything that can be plugged into an electrical wall socket. This section includes Keen home smart vents for zone heating and cooling of individual rooms. Echo’s Alexa integration allows users to interact with a variety of services. Want a pizza? Tell Alexa to order one from Domino’s. Want a ride? Tell Alexa to contact Uber. Want to pay bills? Tell Alexa to access your Capital One bank account to make payments. Send flowers with 1-800-Flowers.com, buy groceries with OurGroceries, book a flight with Kayak, find a plumber with HomeAdvisor, even determine if your kids need a doctor with KidsMD, all via Alexa integration. Alexa also interacts with a variety of streaming music services including iHeartRadio, TuneIn, Pandora, Amazon Prime Music and Spotify. Keep on top of the home’s grounds and garden with the Rachio sprinkler system controller or GreenIQ Smart Garden hub. Other applications include the Ooma Telo (an IP-connected phone with free domestic calling) and the IFTTT (“If This, Then That”) hub that connects to Echo, interacting with dozens of products and service that as of yet are not officially integrated with Alexa. Half the size of the Echo, it comes with a lower quality speaker yet still has the functionality of its bigger brethren. No streaming but a media player connects to the Dot via Bluetooth or jack. Note that it’s the only product in the Echo line that allows audio setup capability. Dot was one of two winners of the CNET October 2016 Editors’ Choice award.